Piper’s parachute is rainbow. Of course. So yesterday morning when we walked into church and saw an enormous rainbow parachute lying on the ground outside through the glass windows, it tried Piper’s patience. What was the parachute for? When can we play with it? How long until we go outside? On the fifth Sunday in our church, it’s an intergenerational service. On the other Sundays, the kids stay with us for “first fifteen” and then meet up with their peer groups. Since we were all together today, the parachute had to be for all of us, right? It was. At the end of service we threw open the glass doors that lead from the main sanctuary to the gardens out back. Then, we did what everyone does when they find a rainbow parachute on the ground. We made a circle, picked up the rainbow parachute, and started bouncing it around. It was like elementary PE class again. Kids and adults alike were shaking the parachute and laughing. We needed a beach ball for the center. Someone shouted, “What do we do now?” With that, Piper dove underneath and ran to the middle of the mushrooming parachute. We couldn’t stop her. We wouldn’t have wanted to. Three seconds later, the other kids followed Piper. Sissy, too. It turned into a kid mosh pit. There was more parachute shaking, more squeals of delight, more fun for everyone. Really, shouldn’t every day have a dose of pure joy? Ours do now that we have a Piper. 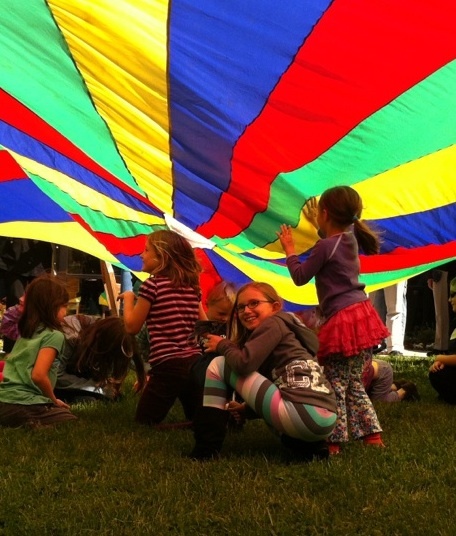 This entry was posted in Daily Dharma and tagged church, joy in every day, kid mosh pit, parenting, piperism, rainbow parachute, what color is your parachute by melissa.scholes.young. Bookmark the permalink.